Perfect for watching July 4th or New Year's fireworks right from the house, deck and hot tub! Our secluded tri-level home situated on 3 wooded acres is conveniently located right outside of downtown main street with unobstructed views of Grand Lake. This 2300 sq. 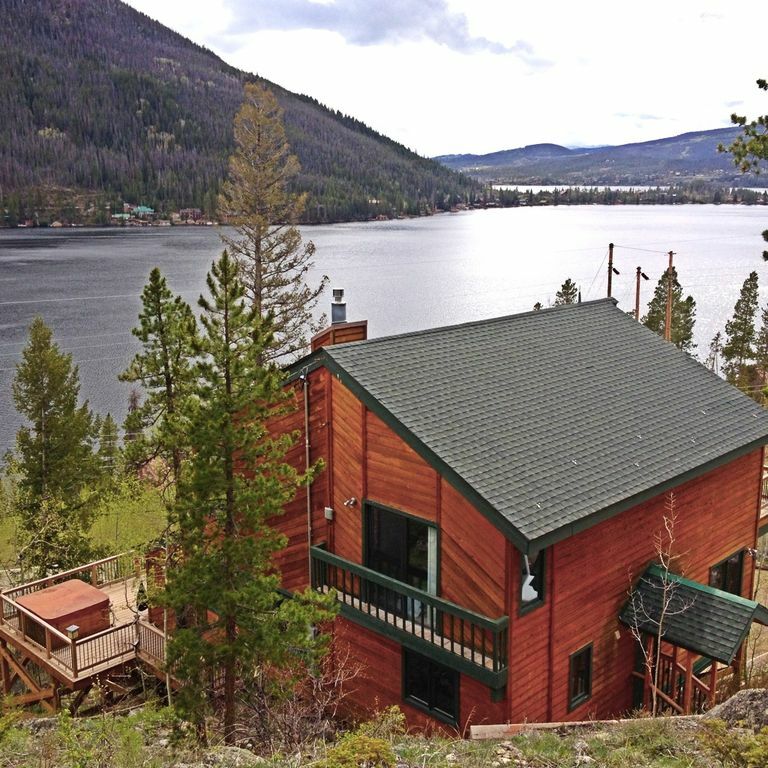 ft. home, called 'The Treehouse' is nestled along side the mountain bordering the Rocky Mountain National Park. Every room in this house has a view! There is a wrap-around deck with a 6-person hot tub overlooking the lake on the lower level. We have provided all the comforts of home with nice upscale mountain furnishings and beautiful art from many local artists. All of our linens are of the finest quality including down pillows & comforters and bamboo sheets for all beds. The kitchen is fully equipped with everything you need to cook fabulous meals including spices, condiments, crock pot, blender, food processor...you name it. We have high speed wireless internet, Dish satellite DVR's with premium movie and music channels, 5 flat screen TV's, and free long distance and games. We keep the house well stocked for convenience with toilet paper, paper towels, trash bags, tinfoil, tupperware, laundry soap, shampoo/conditioner, spices, condiments and cooking ingredients to name a few. To get to the entrance of the Treehouse, you must walk up 2 flights of stairs to get to the front door which puts you at the middle level. Walking down 1 flight of stairs puts you at the lower living area with the gas fireplace and access to the wrap around deck outside with seating/table, a gas BBQ and 6-person hot tub. The middle level contains the dining room/bar, sitting area, kitchen, washer/dryer and a king size master bedroom with full bath. Up one flight of stairs is the loft which has a large sectional couch that can fold out to a queen size bed if needed, one king size room with balcony overlooking the lake, one queen size room with mountain view, and a shared large bathroom with a jacuzzi tub. We are within 10 minutes walking distance (less than one mile) to the end of Portal Road where the boat launch/lake access area is and also access to miles of hiking trails into the Rocky Mountain National Forest. In the opposite direction, we are located within 10-15 minutes walking distance (also 1 mile) to downtown Grand Lake with access to many restaurants and shops. By car you are about 2 minutes away in either direction. In the winter, the rate is $50 more to cover heating costs, daily snow plowing of driveway as necessary, check-in stair and deck snow removal. My husband and his brother built this home originally in 1980. The property has been in their family since before either of them were born. Grand Lake was always a vacation spot growing up having owned and sold other properties. We live in Hawaii and only go there for a change of seasons in the winter months, staying in our home on and off throughout the whole snowy season. This property was purchased in 1940 by parents and then built on in 1980. This home is mostly only rented for 3 to 4 months during the summer. 2 living rooms, Solitude, peace and quiet. Cool weather, down home friendly folks who live there all year long. Built on the side of a mountain, with beautiful mountain views, surrounded by wildlife. There is a living area next to the fireplace downstairs and another living area in the loft on the top floor. Great for entertaining children and adults at the same time. Bought new in 2013. Bottom freezer. In upstairs King size bedroom overlooking lake. We also use a water purification system on our well that makes the water taste great.